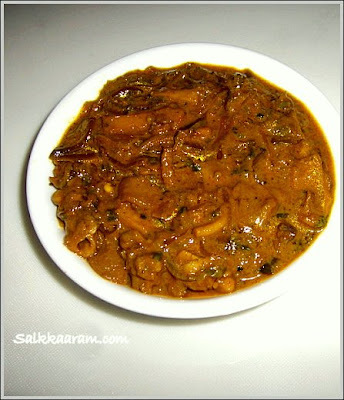 Koonthal Ularthu / Squid Cooked In Coconut Milk | Simple and Delicious ! A simple Squid / koonthal Recipe for you this time, which I got from a news paper clipping. 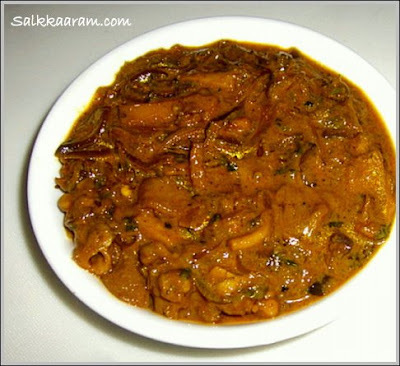 Though my favourite with squid is always the koonthal roast, I loved to take this with pathiri or chapathi. Grind garlic, ginger , green chillies,pepper corns and fennel seeds together to form a paste. Heat oil , saute chopped onions until golden brown. Add ground paste, saute for a while. Add chopped tomato, squid pieces, ground paste, coriander and chilli powders , salt and vinegar. Saute for 1 minute and cook it with enough water. When the fish is cooked well and the water is reduced, add coriander leaves and coconut milk. Stir until you get a thick preparation.Then sprinkle little garam masala over it. Havent heard of this dish. looks spicy n delicious. this does look very delicious!! Seena,ividokke undo dear ? koonthal kandu vellamirakkunnu..I used to make koonthal roast for chappathis..This is such a spicy gravy dear..(most of yours are rich)How is children doing ? Happy womens day. this looks spicyand yummy..ivide kandittu undu.pakshe ithu vare kazhichitilla..
My acquaintance with Mallu dishes remains limited to restaurants that serve them. This squid curry looks very tempting indeed and now I will have to look for it in the restaurant. Looks luscious and spicy ,seena.I never got to taste squid. Gravy looks delicious. Love the rich colour! I love your blog with delicious malabar recipes. I love malabar cuisine. Could you post recipe for gothambu orotti? I heard one of my relatives makes this, and I want to learn how its made. Thanks for commenting! Hope to post the "Godhambu Orotti" recipe soon.. :) keep visiting here. Fantastic looking curry... though I dont like squid, this one makes my mouth water!! Must be very tasty, isn't it? ..It's nothing compared to yours....just a time pass..:)Kuttikalkku sukham alley? Hey, Chef...I just made ur koonthal curry and it's so delicious. Your husband and kids are really lucky. You know what....i just started tasting it little by little and ended up having my dinner alone...shud find some lie to tell my husband now.By the way, Im from Kannur.